315 pages | 6 B/W Illus. 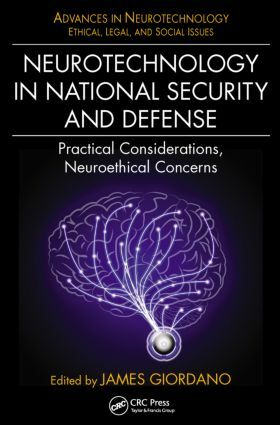 Neurotechnology in National Security and Defense: Practical Considerations, Neuroethical Concerns is the second volume in the Advances in Neurotechnology series. It specifically addresses the neuroethical, legal, and social issues arising from the use of neurotechnology in national security and defense agendas and applications. Of particular concern are the use of various neurotechnologies in military and intelligence operations training, acquisition of neurobiological and cognitive data for intelligence and security, military medical operations, warfighter performance augmentation, and weaponization of neuroscience and neurotechnology. The contributors discuss the neuroethical questions and problems that these applications generate as well as potential solutions that may be required and developed. The book examines how developments in neurotechnology in national security and defense agendas are impacted by and affect ethical values and constructs, legal considerations, and overall conduct of the social sphere. Presenting an integrative perspective, leading international experts lay the scientific groundwork and establish the premises necessary to appreciate the ethical aspects of neurotechnology in national security and defense. It is not a question of "if" neurotechnology will be used in such ways, but when, how, and to what extent. Therefore, it is imperative to foster a deeper understanding of neurotechnology, the problems and debates arising from its use in national security and defense, and how such issues can and should be addressed. In doing so, we can guide and govern the use of these innovative neurotechnologies in ways that uphold ethical accountability. James Giordano, PhD, is Chief of the Neuroethics Studies Program of the Edmund D. Pellegrino Center for Clinical Bioethics; is a professor on the faculties of the Division of Integrative Physiology/Department of Biochemistry, Interdisciplinary Program in Neuroscience, and Graduate Liberal Studies Program at Georgetown University, Washington, D.C.; and is a Senior Fellow of the Potomac Institute for Policy Studies, a Washington D.C. area think tank devoted to the analysis and guidance of emerging science and technology. He serves on the Neuroethics, Legal and Social Issues Advisory Panel for the Defense Advanced Research Projects Agency (DARPA), and is a Fellow of the Center for National Preparedness at the University of Pittsburgh, PA. His ongoing research addresses the neuroscience of pain, neuropsychiatric spectrum disorders, the neural bases of moral cognition and action, and the neuroethical issues arising in neuroscientific and neurotechnological research and its applications in medicine, public life, global relations, and national security. In recognition of his ongoing work, he was awarded Germany’s Klaus Reichert Prize in Medicine and Philosophy (with longtime collaborator Dr. Roland Benedikter); was named National Distinguished Lecturer of both Sigma Xi, the national research honor society, and IEEE; and was elected to the European Academy of Sciences and Arts.